DALLAS, Dec 2, 2013/ — Cute is the word that describes Hello Kitty, but on Thursday, the beribboned Japanese bobtail cat will get her street creds with the launch of the limited-edition Hello Kitty x T.U.K. collection. An alternative brand, T.U.K. Footwear is known for its bold, original footwear styles which are more identifiable with Lightning of Final Fantasy or gothic Lolitas or Harajuku girls in Japanese cosplay. With Hello Kitty being “kawaii” in Japanese pop culture, Sanrio’s collaboration with T.U.K. Footwear is daring and pushes the envelope for Hello Kitty fans. Launched in 1974, Hello Kitty is now 39 years old and can toe into a bad girl image with the limited-edition Hello Kitty x T.U.K. creeper shoe collection. Reaching store shelves on December 4th, expect to find traditional creeper lace up styles, as well as mary janes, each featuring the classic T.U.K. ‘Mondo Sole’. Creepers are available in black and white leather with 3D printed Hello Kitty and red bow patches, as well as a pastel ombre Hello Kitty allover print on faux leather with heart-shaped D-rings. 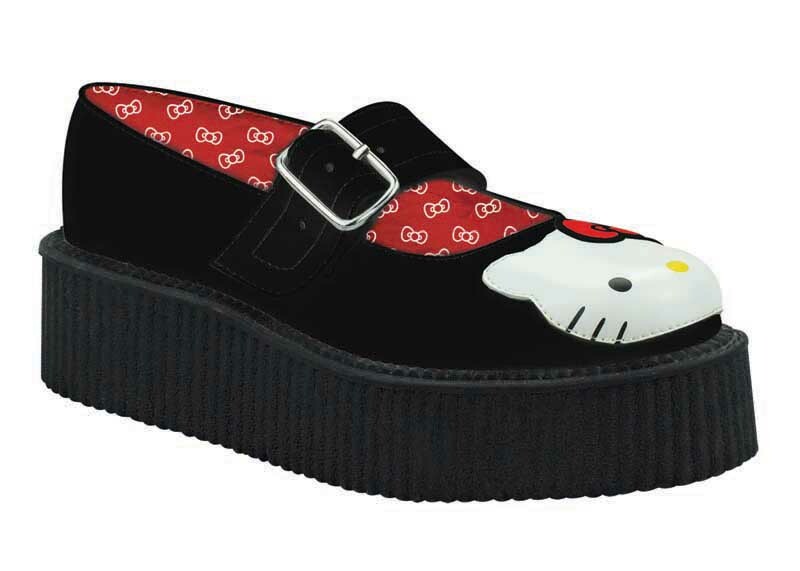 Hello Kitty mary janes will come in leather white-and-pink and black-and-red color combinations. The collection will be available at www.sanrio.com, www.tukshoes.com and other specialty retailers with prices ranging from $90-$100.